First Chapter/First Paragraph/Tuesday Intros is hosted by Bibliophile By The Sea. To play along, share the first paragraph (or a few) from a book you’re reading or thinking about reading soon. The house was an old one, inconspicuous for its size. Curiously so, thought Lydia Asher, when she stood at last on the front steps, craning her neck to look up at five stories of shut-faced dark façade. More curious still, given the obvious age of the place, was the plain half timbering discernible under centuries of discoloration and soot, the bull’s-eye glass of the unshuttered windows, the depth to which the centers of the stone steps had been worn. Lydia shivered and pulled closer about her the coat she’d borrowed from her cook–even the plainest from her own collection would have been hopelessly fashionable for these narrow, nameless courts and alleys that clustered behind the waterfront between Blackfriars Bridge and Southwark. He can’t hurt me, she thought, and brought up her hand to her throat. Under the high neck of her plain wool waist she could feel the thick links of half a dozen silver chains against her skin. Teaser Tuesdays is a weekly bookish meme hosted by Jenn of A Daily Rhythm. Anyone can participate. If you’re new to Teaser Tuesdays, the details are at Jenn’s A Daily Rhythm or on my Tuesday Memes Page. It was one thing to speculate about the physiology of the house’s owner in the safety of her own study at Oxford, or with James close by and armed. It was evidently quite another to go up and knock on Don Simon Ysidro’s front door. This supernatural mystery series features humans James and Lydia Asher and ancient vampire Don Simon Ysidro. I’m just beginning Traveling with the Dead, but it looks like this one focuses on espionage. 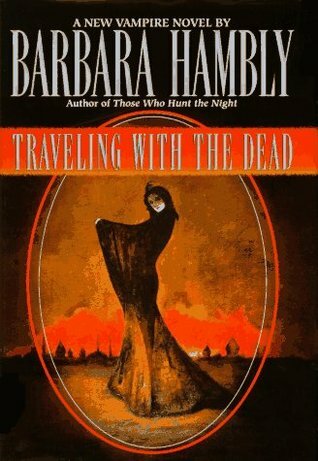 See the post on Those Who Hunt the Night for a list of books in the series and a link to Barbara Hambly’s website. This entry was posted in Books, Fiction, Mysteries and tagged Barbara Hambly, First Chapter, James Asher, Mysteries, Mystery Series, Teaser Tuesday, Vampires. Oooh….very creepy and frightening…LOL. I don’t usually do vampires, but I am fascinated by the description of that house. Barbara Hambly is excellent with descriptions! She really brings her settings alive. I think she has a Masters degree in History. Thanks for leaving your link. Thanks for stopping by to comment. Yours sounds ominous too. Yep, sounds dangerous! I’ve read the first book in the series so I know it will be. I have never heard of this one before, but do seem to remember encountering Barbara Hambly’s name somewhere. This novel sounds very, very interesting! I really like the writing! it seems very Gothic in tone. I’m definitely going to find out more, and add it to my Goodreads shelves. You got it! I don’t read a lot of vampire books any more, but still enjoy series and especially if they’re mysteries. I do hope you enjoy this – sadly the supernatural isn’t my thing as I liked the style of the opener. Yes, you’d be better off with Hambly’s Benjamin January series. Historical mysteries set in 1830s New Orleans. Thanks for coming by to comment and leave your link, Lorraine. I saw yours for The Jazz Files. I’m going to watch for that author. Yes. I’m anxious to see what she does next. I loved the intro (deliciously creepy). I’d read more. Thanks for sharing. Glad you liked it, Diane! I’m not very far yet, but I really enjoyed the first book in the series and this one looks like it will be just as exciting. Ooo, I like the intro a lot. This sounds like a book I would enjoy. Thanks for sharing! Interested in any of the below?